I have a theory that most gardeners will eventually plant a few vegetables in their garden, even if it wasn’t part of their original plan, and many will find a sunny spot someplace for an actual vegetable garden. They may start out with the idea that they want a garden with just flowers and trees and shrubs and may spend hours, days, if not years enjoying it through four of their fives senses - smell, sight, hearing, and touch. But according to my theory, they’ll figure out that a garden that appeals to four-fifths of their senses is not complete. They’ll have a nagging sense that something is missing. There’s nothing to taste! So eventually, even if they didn’t plan to grow vegetables in their garden, they’ll figure out how to add them later. 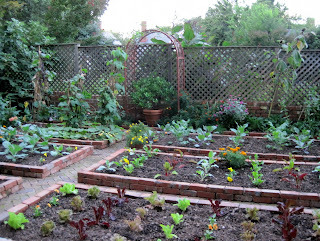 Fortunately, many gardeners realize right up front that they should grow vegetables, too, and plant them in their garden from the beginning, perhaps even picking out the best, sunniest spot for the vegetable garden first, and then designing the rest of the garden around it. This past few days I’ve had the privilege of visiting two beautiful private gardens in Raleigh, North Carolina - the Rose Cottage in the historic near downtown district called Oakwood, pictured above, and pictured below, the garden of John Dilley and Willie Pilkington just down the road from the famous Plant Delights Nursery. I was delighted to find that both of these were not four-fifths of a garden, but complete gardens, with vegetable gardens incorporated into the garden design. My theory holds true. Four-fifths of a garden is not enough. I bet you are having a wonderful time in Raleigh with the Hortiglitterati. What time should I expect you here? 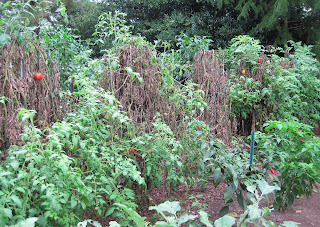 It looks like the late blight in the second vegetable garden. I had read it struck the Piedmont. Hope you're having a great time in Raleigh and will share that news article with us that Flower50 mentioned. How right. A garden should use all five senses. Even without a sunny spot, many herbs will grow in shade, like lemon balm. It has certainly proved true with me - I started out with all flowers, but now I'm hooked on edibles! I hope you are enjoying the Raleigh area - so many great gardens around!